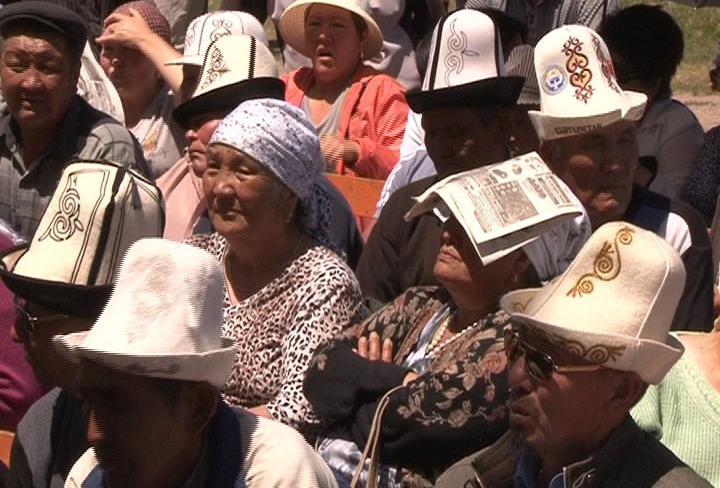 A week-long wave of regional unrest, ostensibly due to disagreements over the fate of a key gold mine, has sent Kyrgyzstan into a state of disorder that looks all too familiar for citizens of the republic. 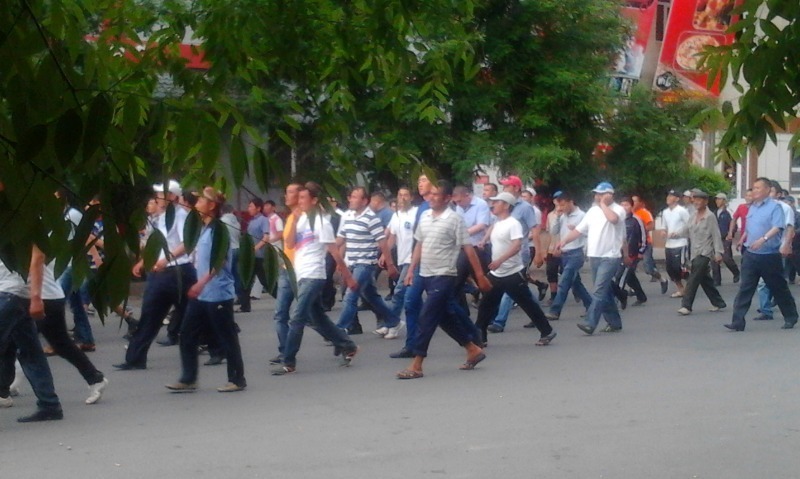 Beginning with a road block in the northern Issyk-Kul province on May 28, protests against the mine's operations there culminated in riots in four separate villages of the province's Jeti-Oguz district on May 31, 2013. During the evening of the same day, a crowd of protesters occupied a local government building in Jalalabad some 500 kilometers away demanding the nationalization of the Kumtor gold mine – currently owned by a Canadian company, the government and private shareholders – and the release of three jailed MPs. Tensions began to rise on the night of May 30, as a group of horsemen in Jeti-Oguz temporarily cut power [ru] to the mine amid loud cheers and obscene remarks. Protesters complain the mine, worth up to 12% of the country's GDP, damages the environment and does not contribute to local infrastructure. Its Canadian directors say the reverse is true. более того, они обесточили рудник!!! Что дальше? They have cut power to the mine!!! What is next? Дальше маргинализм и полный застой. Next is marginalization and complete stagnation. по-моему и то, и другое уже давно наступило. А какие-нибудь меры? To my mind both of these things came long ago. But how about some measures [against the protesters]? А какие меры? Милиция не будет предпринимать меры, а вдруг потом ещё за это накажут, а захватчиков – наградят. But what measures? Police will not take measures, because they will be punished for doing so, while the protesters will be rewarded. The supply of electricity to the mine was subsequently restored [ru], but violent clashes took place from the early hours of May 31 in nearby villages such as Barskoon, where a Spec Ops bus was burned [ru] to cinders by disgruntled protesters. In response, riot police used [ru] stun grenades. The Ministry of Health has reported [ru] 63 casualties from the Issyk-Kul province clashes. After the Kyrgyz revolutions of 2005 and 2010, when two successive governments were overthrown and acts of mass vandalism and looting were committed in the name of national liberation, protests have now become a regular fact of political life in the republic. Many observers argue that such uprisings are rarely grassroots movements, and are usually backed by interested elites, whose own political goals may differ significantly from those of the protesters. An example of this could be the case of three jailed MPs from the nationalist Ata-Jurt party, Kamchibek Tashiyev, Sadyr Japarov and Talant Mamytov. The three MPs were originally arrested and jailed on October 4, when an initially peaceful political rally – also for the nationalization of the Kumtor Gold mine – turned into a mini-scrum between police and protesters. Tashiyev then led some of the more athletic protesters over the gates of the parliament, recalling the power of Ghengis Khan in what a local judge decided was an attempt to seize state power. In a bizarre defense of his actions, Tashiyev (leading the crowd in a purple tie in the video below) said he was just trying to get to work. But while politicians are often accused of manipulating ordinary citizens, “professional protesters” have grown in number over the years since Kyrgyzstan's first revolution. The country remains one of the poorest in the former Soviet bloc, and a volatile political scene has ensured opportunities for political entrepreneurs at all levels. Про то, что демонстрантам дают деньги мне рассказали жители, которые туда ходили. Там по одной тысяче сомов раздают. People who participated in the riot told me that the demonstrators are given money. They were given one thousand soms [20 USD] each. On June 1 Kyrgyz Prime Minister Jantoro Satybaldiev visited [ru] Jeti-Oguz to meet with protesters. The protesters promised not to block the road to Kumtor in the near future. However, by that time, media focus had already shifted [ru] to Jalalabad in southern Kyrgyzstan. The protest there was organized by Meder Usenov – a coordinator from Tashiyev's Ata-Jurt party, who was later “elected” as a “People's Governor” by protesters that seized the regional government building on the evening of May 31. On June 2, he mysteriously disappeared [ru]. The political meeting in Jalalabad was a fairly routine affair until protesters seized the governor's building. (Photo by Evgenny Pogrebnyak for Kloop.kg, used with permission). The State Committee for National Security of the Kyrgyz Republic has since published [ru] information about the arrest of Usenov under Articles 295 (forcible seizure or forcible retention of power) and 297 (public incitement to violent overthrow of the constitutional order) of the Criminal Code of the Kyrgyz Republic. 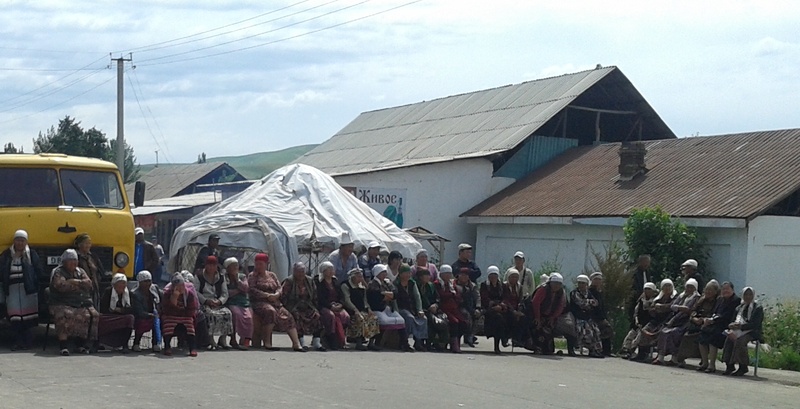 Meanwhile, on the evening of June 2, supporters of Usenov blocked the Bishkek-Osh highway, parking vehicles and setting up yurts on the major transport link between the country's north and south, demanding the release of their self-proclaimed governor, the three Ata-Jurt MPs, and the nationalization of Kumtor. As a result, hundreds of cars accumulated on both sides of the road. Law enforcement officials are still trying to negotiate with the protesters. Yurts, heavy goods vehicles and men and women from Kyrgyzstan's south form part of a formidable roadblock disconnecting Kyrgyzstan's geographical halves. Право на митинги имеют все граждане. Но устраивать беспорядки и пытаться захватить государственную власть не имеет права никто. Every citizen has a right to participate in meetings. But no one has a right to create disorder and try to seize state power.